James Pirages has more than 30 years of experience representing management and employers in labor and employment matters. He handles investigations of unfair labor practice charges, and represents employers in proceedings of the National Labor Relations Board and Illinois State Labor Relations Board. Mr. Pirages also deals with Equal Employment Opportunity Commission and Illinois Department of Human Rights discrimination charges against employers, investigating charges and, when necessary, speaking on behalf of clients at hearings before those administrative agencies. In addition, Mr. Pirages advises clients in matters involving OSHA inspections and citations, and has effectively contested the agency's citations and administrative actions. Mr. Pirages' vigorous advocacy of employers extends to wage and hour matters, from contesting the results of audits completed by the Illinois Department of Labor and United States Department of Labor's Wage and Hour Division, to representing clients in federal court litigation. Mr. Pirages has extensive experience acting on behalf of employers in matters involving union representation. He advises on certification and decertification of third-party organizations, and helps employers maintain a union-free working environment. He also handles charges involving claims of secondary boycotts and other illegal activity by unions. For companies with unions, Mr. Pirages represents management in collective bargaining negotiations and advises on discipline and discharge matters (including "preventative" measures to avoid legal claims over these actions). His proactive dispute avoidance counsel includes the drafting of personnel rules, employee handbooks and affirmative action programs that comply with employment laws and regulations. In the area of employee benefits, Mr. Pirages handles defense of collective bargaining agreement claims involving employer obligations to contribute to pension, health and welfare funds. He also helps clients resist assessments of multi-employer withdrawal liability pursuant to the provisions of the Multi-Employer Pension Plan Amendments Act of 1980. 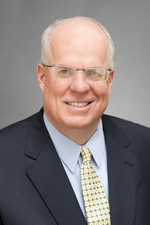 Mr. Pirages is the former leader of the Labor & Employment Practice Group of Hinshaw & Culbertson LLP. He is also is a past partner-in-charge of the Rockford office. Mr. Pirages joined the firm in September 1987. "Advanced Techniques for Managing the Interplay between the ADA, FMLA and the Workers' Compensation Act"
"Liability for Sexual Harassment Outside the Workplace"
"Record Keeping and Record Retention"
Presented "The Labor and Employment Law Year in Review" for the last seven years on behalf of the Employers' Association of Illinois.